Center Stage Posing Suit Customers. Thank you for allowing us the opportunity to suit you! magic when designing a fitness suit. I loved my suit that I wore March 8th 2014. Withouta doubt I’ll be sending people her way and will be having her always make my suits. I contacted Anissa Rogers with Center Stage Posing Suits just 6 weeks prior to my show. Anissa was very prompt! I was very impressed with how she kept in contact with me throughout the process to clearly understand the detail I was wanting in my figure suit. I got my suit in perfect time for my show. It not only fit perfect but it was absolutely stunning! I won 1st place in my class, won my pro card, and 1st place overall!! Thanks to Anissa Rogers for all her hard work she put into my suit!! I am excited to have her make my next suit for the Pro stage. -Desiree B.
I love my suit! It fits perfectly and has a beautiful design. Anissa was well within my timeframe and was very helpful. She really knows what she's doing! 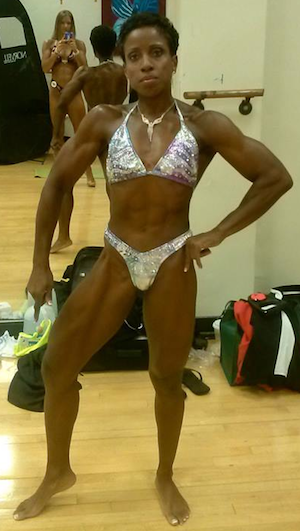 -Melissa W.
I am so happy with the Figure Swimsuit that you custom made for me for the NGA Champions and Challengers Competition. The red color that you recommended went well with my skin tone. Thank you so much for getting the swimsuit ready in time for the competition. -Thienthu T.
Anissa took what was a very basic but set idea I had in mind for my figure suit and with her creativity and design skills, truly made it come to life. It was all I was hoping for and more. My suit was made in an extremely timely manner and is of beautiful quality. Thank you so much Anissa for creating my perfect figure suit. I cannot wait to work together in the future! -Sara H.
Both suits look so good on me! Can't wait for everyone to see my first 2 suits I purchased and got custom made after all these years! I hope they go crazy when they see me in my blinged out night suit! Thanks again Anissa!! –Jehina M.
I wanted to write and thank you for an amazing experience with you at Center Stage Posing Suits! The suit is absolutely gorgeous, fit beautifully and was everything I asked for...in record time!! I really appreciate you being able to deliver such a high quality suit on such short notice!! I will highly recommend you to anyone I know that is in the market!! Here is a shot form the OCB Florida West Coast Classic!! Thank you Thank you Thank you!! –Kathy A.